If melasma isn't your favorite "baby face," you can clear it naturally. 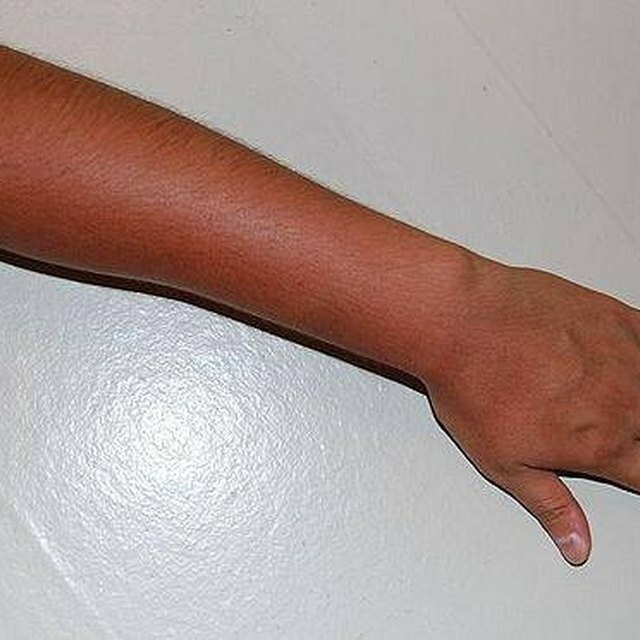 1 How Does Tanning Lotion Work? If your pregnancy left you with a beautiful baby and dark spots on your face, you have experienced melasma, also called chloasma, or the "mask of pregnancy." Dr. Jean Bolognia, Professor of Dermatology at Yale University, in a 2010 article published by the American Academy of Dermatology, reassures sufferers that pregnancy is not the only cause, and that you do have options for natural, at-home cures. Melasma is harmless but can be troubling cosmetically. Skin care specialists practicing with Purefect Your Skin describe a home-made lotion combining the traditional Chinese herbs gotu-kola and ginseng. Start with ginseng tea as the liquid base for your lotion. Use only enough to make a paste-like mixture containing equal quantities of gotu-kola and ginseng powders. Make a fresh batch for each of two daily applications, using 1/8 tsp. of each powdered herb. Apply it for 10 to 15 minutes to your melasma spots, then rinse thoroughly. Moisturizers or sun block may be used for added protection between applications. Continue, usually over a period of weeks or months, until you see the amount of lightening you want. Dr. Ray Sahelian, a health care author and natural medicine and dietary supplement specialist, cites a 2004 research study published in Phytotherapy Research investigating grape seed extract. This substance is rich in proanthocyanidins, which show promise in treating melasma when administered as a dietary supplement. He calls this a second-line treatment; it is effective and safe for individuals who do not want to use the first-line surgical, dermabrasion or laser treatments to lighten their facial spots. Raspberries are also on Dr. Sahelian’s melasma home-treatment list. They contain a substance called ellagic acid which has been found effective in lightening melasma. Other foods that contain therapeutic levels of ellagic acid include walnuts and pecans, cranberries, pomegranates, blackberries and strawberries. Dr. Sahelian cautions that an important ingredient in all natural cures for melasma is patience. Months are often required before results reach desired degrees of lightening. Dermatologist Elizabeth L. Tanzi, addressing the American Academy of Dermatology in 2009, said that some home remedies for dark spots like melasma, age spots and liver spots, are the same as those you use to prevent sun-darkening of your skin. Sun protection factor, or SPF, of 30 or higher, is your best prevention against continued darkening of melasma. Shade by means of a lotion, clothing, hats or anything you can put between yourself and direct sunlight will allow other lightening treatments to do their work. Dr. Tanzi cautions that sunscreen is only useful if you use enough. Apply a full 1-oz. portion for complete body coverage, or a proportionally dense coverage for your face only, if melasma is your only dark-spot problem. Be sure to apply your lotion 15 to 30 minutes before outdoor exposure. Re-apply it every two hours and immediately after swimming or sweating. Why Do Tanning Beds Make Me Orange? How Do I Reduce the Dark Skin From My Face Where I Shave?